Blurb : The stories in this collection brings home the simple truths of human nature, the essential human ingredients. The author has you reflecting, smiling, as you relate intimately to the characters and the situations that people these stories. Review : ‘Life and the Grey Notes’ is a short story collection consisting of 10 short stories. Each story is unique in its own ways. The language is simple & smooth. Each story is unique in own way. The entire book is a nice package. The storyline is just mind blowing, it keeps you engaged and connected throughout. The same genre keeps you curious… You will not be able to put down the book till you have read the end of it… I liked the first hand written letter style of every story it’s different. The lines were eye-catching and this made me to read the book. For me, Life and The Grey Notes was a relaxed read. It connects you with your day today life. I will definitely recommend everyone to Read this Book, it’s worth your valuable time. The book is quite addictive and will engage you as the story proceed, as I have already told writing is very good and simple but I must say beautifully expressed. Many Congratulations to the author for his first book. Cover: The cover selection is quite injustice to the title. As per the title ‘Life and the Grey Notes’ the cover could be better… especially the color combination… brown color is not going with this title at all. Life and the Grey Notes, a novel by Mayank S. Sengar, is published by Zorba Books. The cover is very high on detailing. It’s a dark and complex cover, so can have variable opinions. Some readers might feel confused and put off while others, may feel intrigued. I tried to be neutral and saw a jeweller’s board peeping through a complex network of wires. Could not much understand what the author was trying to convey through a cover like this, but then maybe he wanted us to see life as it is—very complex; everything is right before our eyes and yet we fail to see everything! Mayank Sengar hails from a family of culturalists based in the holy city of Varanasi. He is blessed with a keen eye for detail and a fine sense of appreciation for life’s varied experiences in equal measure, glimpses of which can be found in his work. He has a talent for being able to connect easily with people from varied spheres of life, and this reflects beautifully in the way the characters in his stories are very real, very compelling, irrespective of which strata of society they belong to. The blurb reads as, “The stories in this collection brings home the simple truths of human nature, the essential human ingredients. The author has you reflecting, smiling, as you relate intimately to the characters and situations that people these stories. From the inescapable dilemma of a tea stall owner caught in the mesh of societal hypocrisy, to the inherent tendency to presume and judge that lurks within each one of us, the cherished place we accord to individual faith and the element of divinity, the intricately entwined threads of emotion in the Indian ethos can all be derived from this collection of experiences in form of a book. The turning point in some stories where the protagonist emerges as a hero or confronts his own inevitable human frailties will warm many a heart, cutting across reader demographics such as age, geography and language. The 10 stories are centred on the theme of life and its complexities. In a line, the book is a mirror unto life. It gives a realistic picture of life and doesn’t go into exaggeration. Mayank has managed to unleash his observation skills through these stories. Each story is well written as he has picked various human traits; some subtle while the others not that much. Interestingly, Mayank has drawn the inspiration for most of the stories from his very own life. All the story titles are unique and give you so much to think about. The stories penned down by Mayank bring out a different aspect of human behaviour even after being based on one single subject, i.e. life. The author has successfully portrayed deep and hidden realities. The language is simple and easy to comprehend. Readers will find the events quite interesting. I found it genuinely engaging. The subject is tackled beautifully by the skillful author. You don’t have to relate to all the stories to enjoy them. The lucidity that comes into play while narrating the stories is marvelous! How Mayank’s hometown Varanasi becomes the centre stage of all affairs, how a father waits for his son’s calls as he breaths his last, how a retired man starts his quest for peace in a modern techno-savvy world are some of the many reasons why you will keep turning the pages to find out what happens in each of the stories in Life and the Grey Notes. Further, this 144-page book is good enough to expose the double standards of society we live in, the hidden secrets and the deep seated fears that we all have. It’s a light read and overall a compelling book. 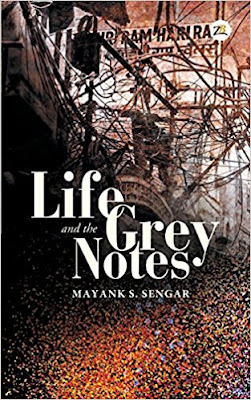 Life and the Grey Notes by Mayank S. Sengar is a book that most of us have within us. Anyone of us can write it, but not many of us write it. Mayank picks up slices of life through those moments where we sometimes stop and reflect. Most of us let that moment pass – the moment that can potentially change our perspectives of life and sometimes even its direction. Mayank picks up one human trait like greed, deceit or ambition and then weaves a story around it. He begins his story by talking about one of the traits, Basically, he shares his views on the subject and then after a pause starts the story. Most of his stories seem to be inspired by his own life. His hometown Varanasi remains at the core of each story although it hardly plays any role in the story. It could have been any small town in India, but author categorically mentions Varanasi. Personally, Varanasi is one of my favorite cities, a city where I have spent good one year of my life as a child. All stories have a sense of simplicity. You can relate to more or less everything the author says if you have lived in India. I liked the way he brings out relationships, especially the ones that teach you something in life without really being a formal teacher. His story about a father whose connection to his son is through a phone and how he dies waiting for a phone call is touching. His story about a Chai Wala who chooses to remain honest even when life presented him with the best opportunity to be not so is endearing. His story about the appearance of a relative to show him guidance is something a lot of us have experienced though we let it be a matter of fantasy than deep connections. His story about a friend who was always envied for his luck till in one stroke he became the most unlucky guy tells you about the checks & balances in all our lives. In this story, I had a disagreement with the author – it is not a story of deceit as he has interpreted but a story of how we all have the same quota of luck and opportunities. We should not envy anyone who seems to be lucky at this moment to us. His story about Pets is something I hope every pet owner reads. How pet owners take away the freedom of their pets for their own lack of companionship. I also liked his story on how the religion sometimes pushes us to have more faith in ourselves, even when we continue to blame the religion for not giving us what we prayed for. Overall, the author Mayank S. Sengar comes across as someone deeply spiritual. He is someone with an ability to see the God in the most mundane places, in most life situations. Is it to do with his growing up in the divine city of Varanasi? Did he had to move away from the city to realize what the city is meant to teach? I liked reading his simple stories, I wish there was a bit more garnishing – some flavor of the cities the stories are based at or some more character etching of the characters. From the inescapable dilemma of a tea owner caught in the mesh of social hypocrisy, to the inherent tendency to presume and judge that lurks within each one of us, the cherished place we accord to individual faith and the element of divinity, the intricately entwined threads of emotion in the Indian ethos can all be derived from this collection of experiences in form of a book. The turning point in some stories where the protagonist emerges as a hero or confronts his own inevitable human frailties will warm many a heart, cutting across reader demographics such as age, geography and language. Heartwarming, thought-provoking, yet light and humorous, this collection makes an ideal read with your leisurely cuppa chai..
Cover : A jeweler’s board peeing through a complex network of wires. I can’t connect to the jeweler’s board but this complex network of wires is surely related to our life. In life on many occasions, everything seems so complex and confusing that we fail to see everything even if it’s in front of our eyes. Review : As, it’s already mentioned in the blurb, it’s a collection of short stories. In all ten stories are there. Each story is quite simple but amazing in it’s own unique way. The content and style makes it so easy to connect to the stories that it makes you think. Each story has a unique flavor. And I loved few lines so much that even I have marked them to read again and again. A simple and honestly written novel, really a worth read. If you want to read something to which you can connect easily…. Just go for it. Here is one of the best books that I have read in the recent past. ‘Life and the Grey Notes’ by Mayank S. Sengar consists of 10 short stories where the author connects human emotions with varied events, objects, places etc and makes you realise that each and every person’s life is as important and filled with diversities and variations as that of Newton or Bill Gates. If I have to describe about the book in one word then it is ‘AWESOME’. It consists of intricately woven stories that describe about the so called mundane events in our lives and how they are as important as the falling down of Newton’s apple which bought a paradigm shift in our world. It’s just that we don’t realize the fact that our complexities are equivalent to those faced by highly deemed scientists and billionaires. 1. The book is crystal clear without any spelling or grammatical mistakes. 2. The title is apt as the book shows a mirror to the reader. It neither talks about the idealistic nor the cunning facets of life rather it gives a realistic outlook to the reader. 3. The best part of the book is the flow with which each story moves and the moral it imparts at the end. It starts off with some natural event or a brutal reality that exists in the world and then the author connects it with a contemporary story which I am sure will connect to all. 4. The message at the end of each story are well thought off and justify it completely. 1. There are no demerits except the front cover. I can understand that the author wants to convey the intricacies in life by showing a complex network of wires but it is not eye-catchy. I wanted to give a 10/10 to this book but I am taking away 0.1 for its ‘not so eye catchy’ front cover. I received the book Life and Grey notes by Mayank S. Sengar as a review copy from BecomeShakespeare.com. The book is a collection of ten short stories. The collection of short stories in English, Life and the Grey Notes, brings home the simple truths of human nature, the essential human ingredients. The author has you reflecting, smiling, as you relate intimately to the characters and situations that people these stories. From the inescapable dilemma of a tea stall owner caught in the mesh of societal hypocrisy, to the inherent tendency to presume and judge that lurks within each one of us, the cherished place we accord to individual faith and the element of divinity, the intricately entwined threads of emotion in the Indian ethos can all be derived from this collection of experiences in the form of a book. The turning point in some stories where the protagonist emerges as a hero or confronts his own inevitable human frailties will warm many a heart, cutting across reader demographics such as age, geography and language. Suitable read right from a teenager to a young adult to an adult. Heartwarming, thought-provoking, explores human relationships and human psychology yet light and humorous, this short stories collection makes for an ideal quick read with your leisurely cuppa chai. The author has mentioned in the prologue that the black and white episodes in our lives are easy to deal with and the grey shades are difficult to understand and handle. He also mentions that this book is a collection of grey incidents of life presented in the form of short stories. I am not discussing the book story wise because I do not want to spoil the fun. The stories have been penned in a manner that is easy to understand but the message goes deep. The language is simple and the flow is good. The characters are relatable and have been developed well. There are many instances in the stories that have happened in reality like the world cup. The stories have humour as well as some seriousness. Each story has a message to deliver. Loved the book and will recommend it with a small request to read each story and savour it before moving to the next. Disclaimer: I received a free e-copy of the book from BecomeShakespeare.com. in return for my honest review. I have NOT received any monetary compensation for the same. Life and the Grey notes is a book comprising of 10 short stories that dwell between the blacks and whites of our lives, the grey matter. Mayank has rightly shared snippets of life in the form of deceit, ambition, aspiration, love, family and much more. Each story is cleverly weaved into stories that teach you about life and that’s what has changed my perspectives about a few things I earlier saw otherwise. Each story starts with an introduction about the subject or topic that Mayank has weaved a story from. The story then starts after the quick introduction. There are varied stories ranging from the story of the man who fails to somehow be connected with his father and loses him in the bargain by being at Gurgaon, to how pet owners unintentionally fail to understand pets sometimes, and how it’s important to understand our calling and what we really wish to be with our lives – a story resonating with the characteristics of Bermuda Triangle. From the inescapable dilemma of a tea stall owner caught in the mesh of societal hypocrisy, to the inherent tendency to presume and judge that lurks within each one of us, the cherished place we accord to individual faith and the element of divinity, the intricately entwined threads of emotion in the Indian ethos can all be derived from this collection of experiences in the form of a book. These stories will take you through the minutes of living, making you doubt your conscience, ask you vivid life questions, confuse you or take you on a journey of simple living. It depends on you and only you as to how you perceive it to be. For me, Life and the Grey Notes was a quick breezy read and allowed myself to clear my mind. It’s a read you can come back to at any point of time when you feel you need an answer to something that has been stuck in your mind all this while. I’d recommend this book to those that prefer to read about life tales, about experiences, about simple living, about family and connections, about love and more so about finding yourself.